The first book I'm going to mention for March Magics, Dodger by Terry Pratchett, isn't one I read this year. I actually listened to it as I wrapped Christmas presents in December. 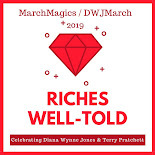 But the reason that I think it's a great one to share with all of you is that it isn't what you might expect from Pratchett if you're only familiar with his Discworld books. The titular Dodger is a young man who is a tosher, someone who searches the sewers under Victorian London for valuables. His most priceless find, though, ends up being a young woman that he rescues from some very seedy men. 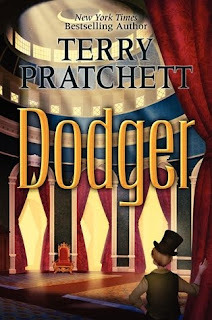 Dodger then begins a journey through social strata, running into the likes of Dickens, Disraeli, and, eventually, making it all the way to the top. There was so much to like about this story! There were amazing historical details, amusing uses of historical personages, harrowing moments, and also extremely touching ones. It was also just incredibly fun! Dodger is an amazing character and I plan to reread this book many times to spend more time with him. If you're looking for a book to read this month but aren't really into fantasy/sci-fi, this would be a perfect choice. Pratchett is an amazing author no matter what the genre. I enjoyed this one, but it left no lasting impression on me, which is what I've found for all the Pratchett books I've read (except Good Omens with Gaiman). I'm not sure why. Maybe I just haven't read the right ones yet. I needed this post today. I checked out Dodger from my very sad library. It was the only Pratchett or Jones book on the shelf. I was very upset with that. I don't know if that attitude was with me when I picked up the book but I put it down after just 10 pages. I didn't want to read it anymore. I read this and now I can't wait to get home to start all over!